Most of us who have marched through the long history of art began that rich journey in exactly the same place: Ancient Egypt. Some of us focused on monumental objects like the pyramids and the Sphinx. Others took delight in the intricate and ornate, like precious amulets and beads fashioned out of faience or stone. Here’s where we might have discovered our earliest artistic renderings of the scarab beetle, which symbolized rebirth. These amulets were often placed in the tombs of mummified royals, typically over the heart. Thousands of years later now, some of us still have our hearts connected to images of the sacred beetle. Witness the work of Wendy Wallin Malinow. Wendy’s articulated sculpture was handformed in pieces and cured in many stages She carved, incised, and cured the black clay. Then she used white polymer clay to backfill the carved designs and cured again. 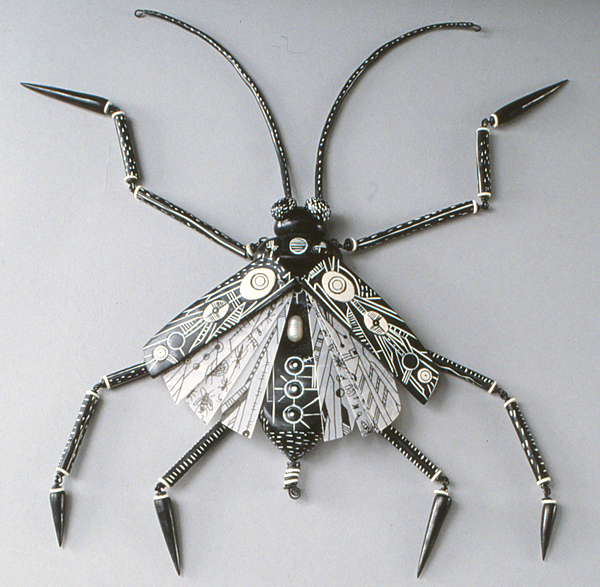 The appendages are hollow and wire runs through the tubes to articulate the joints. 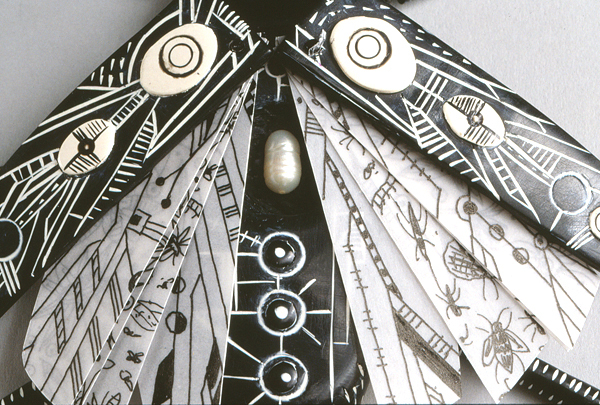 The polymer wings are riveted and swing open to reveal multiple pages of vellum decorated with ink imagery. Spreading the wings uncovers a concave area which houses a white pearl.